1. I trust you not to make things difficult for me. 2. We trust each other not to draw unnecessary attention to ideas that will require more work. 3. I trust you not to challenge my thinking. 4. We trust you to be normal and act like you’ve always acted. 5. I trust you to only speak to me about your problems. Rarely do teams utter these statements. They don’t have to: The moment you walk into a meeting you can smell these ill-conceived arrangements, most of which are designed for self-preservation. – Trust doesn’t limit potential; it expands opportunities. – Trust doesn’t censor and separate; it drives inclusion and expands teamwork. What if what we think trust is, isn’t trust at all? 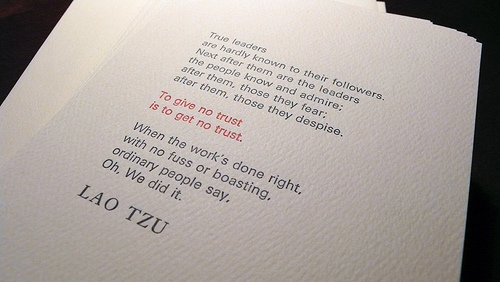 Most importantly, what type of trust does your team need to win? This typing TRUST is a MUST! Keeps us balanced and grounded. Eliminates group think and gets us closer to the REAL truths that will enhance everyone’s growth and success. I could not agree with this post more. This type of subtle “intimidation”, inspired by self-protection rather than altruistic team development, is devastating to a company’s culture of continuous improvement (that would normally drive productivity). Such an attitude lacks the courage of true leadership. It is one that elevates self and safety over doing what is right and ultimately more profitable for one’s company. True leadership empowers, allows others to be great and develop to their own potential. It encourages risk, feedback and alternatives. May each of us have the courage to live for others and for what is better rather than what keeps us “safe”.